I first saw a picture of this chair in a book called 1,000 Chairs. The small picture interested me in every way; it captivated my admiration for the shaping and carving processes and also my affection for Art Nouveau. My feelings at that first moment were that I would love to have the opportunity to reproduce and thus understand that piece in greater detail. I then decided that reproducing this chair for my major project was an opportunity that I could not ignore. The chair was designed by Hector Guimard. It was originally designed for Maison Coilliot in Lille, France, between 1898 and 1900, but later was also used in Guimard's Castel Henriette in Sevres, Paris, between 1899 and1900. In order for me to try to understand this abstract design, I thought that it was best for me to try to understand the man behind it. 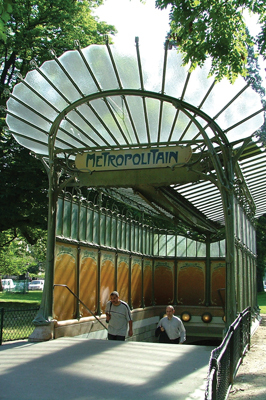 Hector Guimard has been recognised as one of the most important French architect/designers of the Art Nouveau period. 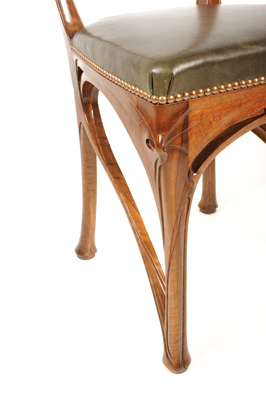 Guimard's furniture, like his architectural work, was extremely avant-garde. Guimard fully exploited the expressive potential of carved wood by having it hand shaped and heavily carved in a way that accentuated the organic lines. These organic lines ran throughout the houses he created, which resulted in a unified design. The furniture was an integral part of his buildings. Guimard once used the analogy of sap running through trees to communicate his abstract idea. He said that the flowing of sap through trees is an essential characteristic, like the qualities he wanted to represent in his art. Not something like the flowing of sap in particular, but the 'sap of things' in general. 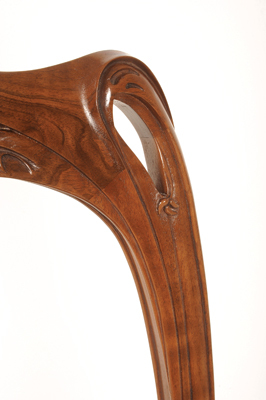 From trying to develop a basic understanding of where Guimard found his inspiration to create these chairs it is possible to see that his 'abstract naturalism' of 'rejecting the flower and the leaf, and seizing the stem' clearly flowed throughout these walnut (Juglans regia) chairs. The chair's design is quite abstract but one thing is certain. They are truly organic. piece. The prototype also allowed me to consult with different people on how the chair should progress. These consultations altered the prototype. 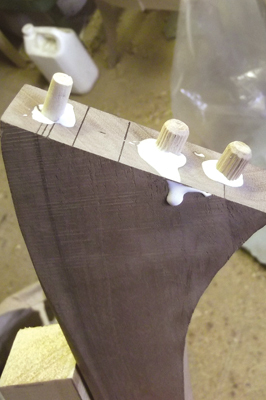 The back section of the final walnut chair is wider, thus changing the taper of the front section to the back section. Also, the carvings are much deeper in order to create a better effect. When it came to the wood for the chair I did not have a choice, as it was clear from the pictures that the original chair was constructed from walnut. Also, as the original chair was French and constructed between 1898 and 1900, the walnut would probably have been of a European variety. European walnut for me was quite a nice wood to work with. At times, especially when it came to the darker heartwood, the grain was a little unpredictable and tended to be a little bit wild, so some care had to be taken when working on these sections.Once worked with a sharp scratchstock and cabinet scraper, the walnut acquires a silk-like finish. 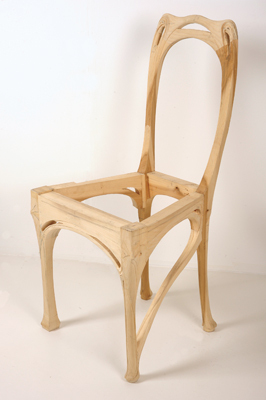 Beech (Fagus sylvatica) dowels were used in the construction of the chair mainly because of the gaps in the front and side rails. A mortise and tenon joint would have been the traditional joint of choice for the front rail, but I felt that this chair was an exception because of the gaps in the rails. If tenons were used they would have been quite small, so I felt that dowels would offer the same structural qualities as the mortise and tenon in this case. Also it would have been inefficient to make jigs for only one chair, which would have been necessary for the mortise and tenon joints. Dowels offered a more efficient solution. I used PVA glue through the chair's frame. It speeded up the process of assembly as it is quick-drying. The carving pattern was traced from the templates onto a transparent film using permanent pen. The new template was then placed on the chair and using carbon paper, transferred the to the wood. Once the pattern was applied to the chair, I could then commence with the carving. 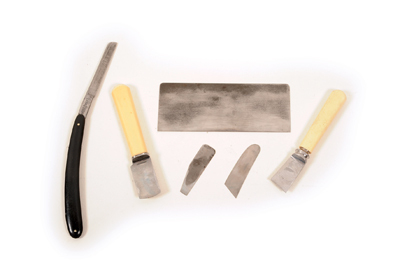 The large spokeshave was used mainly for removing larger quantities of wood and the smaller one used for removing smaller amounts. The small stock scraper was used where unpredictable curved wood was an issue and the large one used where there was unpredictable flat wood. 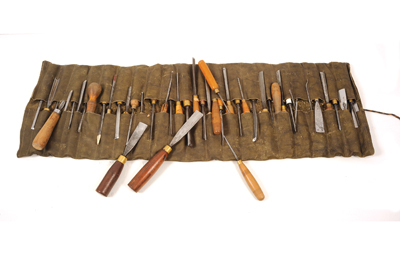 The shape of the carving tools would generally determine the shape of the wood, with the 'V' tools forming the outlines of the carved sections. The scrapers, some of them home-made, were used to erase the marks left by the carving. The legs were firstly cut from the front view, and the offcuts that resulted from these were then reattached, so the outline drawn on the side view could be used for the next cut. This is the same machining process that would be used for a cabriole leg. The under-frame section was cut from 25mm stock. This was the last section of the chair that was fitted. The fitting process was an intricate task as there were angles and housings to be incorporated. 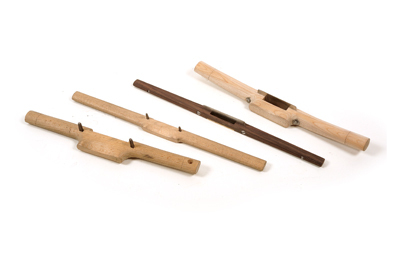 Again, dowels were used on the jointing process of the under-frame section. Once the under frame was attached correctly to the front section, the process of connecting the front section to the back section could commence. Once the cramps were removed the chair could stand as one unified piece, thus allowing me to complete the carving and shaping processes. Cutting the outline for the back feet differed from the procedure involved in cutting the front legs. 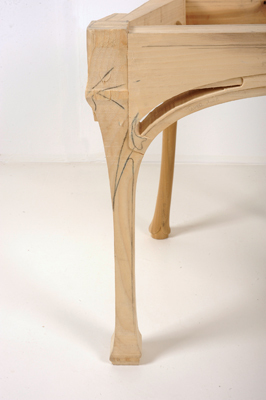 The cabriole style of cutting wastes too much timber, and cutting in the cabriole format would result in some sections of the foot being at an incorrect angle on the crest rail. The process that I adopted for cutting the back feet was firstly to cut the side section and then remark the newly cut area to cut the front section. Staining the wood was a necessity, as the rails of the chair were a different colour from the rest of the frame. I used a combination of Van Dyke crystals as water stain followed by coats of a garnet polish first, Special Pale polish and finally waxed with both black and brown wax used selectively to patinate and highlight certain carved areas. The webbing that I used for the chair was 75mm Irish linen webbing. 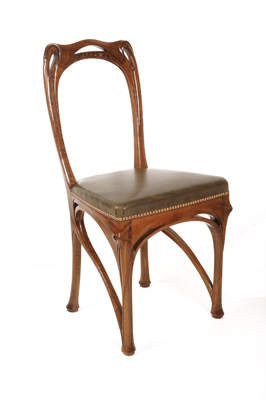 As French chairs normally possess wide exposed webbing, one can assume that wide exposed webbing would have been used to upholster the Guimard chair. The original chair was finished with brown leather, but I found it difficult to source brown leather that suited the chair, as it clashed with the brown chair frame. 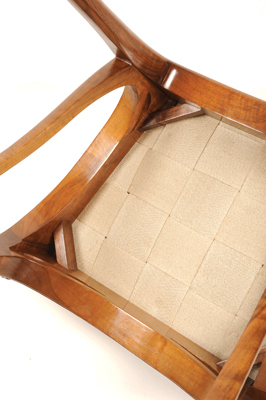 Although green was not the original colour for the chair, I felt that it complemented the walnut frame. I used a French natural shade nail to fix the leather. This was a really great project for me. Looking back at the objectives that I had at the start of the project, to push my abilities and develop an understanding for the chair stand out for me. This project challenged me and thus it gave me the opportunity to learn and develop in an area I am particularly interested in. Let us introduce Patrick Morris, a carpenter from Ireland who decided to ramp up his career aspirations considerably at Bucks New University. I think you will agree with us that his major graduation project is a far cry from everyday carpentry work in terms of carving skill and the complexity of interpreting a unique design. Currently based at High Wycombe, Buckinghamshire, Patrick has 14 years of experience in woodworking, and has recently completed a BA (Hons) in Furniture Conservation, Restoration and Decorative Arts. 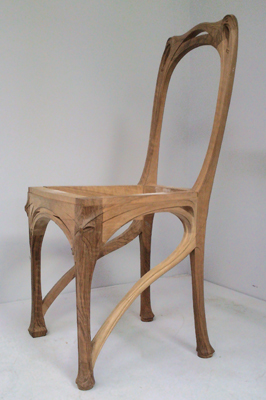 This gave him the opportunity to develop projects, such as building this incredible replica of an Art Nouveau Hector Guimard chair, and to restore pieces from the Georgian and Victorian periods. 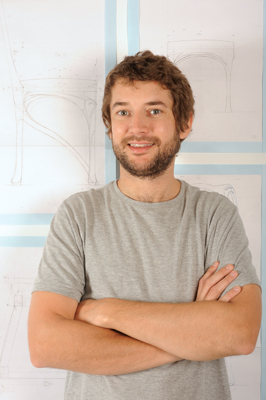 During his studies, Patrick started work in the high-end furniture industry, alongside chair makers, and at a woodcarving workshop, where he continues to work.